Southern California's Mediterranean climate and varied landscape of beaches, deserts, and mountains have made it one of the most desirable places in the world to live. 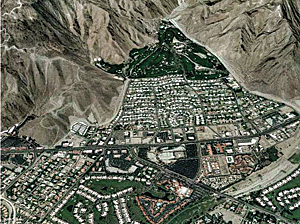 Topping out at more than 25 million people in 2010, the region is the second most populous in the United States, and the population explosion and housing boom have pushed many developers to build in high-hazard areas atop alluvial fans. Alluvial fans are gently sloping, fan-shaped landforms that are created by the natural deposition of eroded materials from an upland source. Up to 40 percent of Southern California's 10 counties are covered by alluvial fans, which can be subject to dramatic changes caused by natural disasters. From 1950 to 2007, all 10 of these counties have been declared flood disaster areas at least three times, adding millions to the multibillion-dollar costs of disaster recovery in California. That number will only rise as the number of people and structures located in areas of risk continues to increase. Flood management has been successful in protecting life and property but has resulted in the loss of riparian and wetland habitats, worsening water quality, and decreased groundwater recharge. Increasingly, alluvial fans are being recognized for the multiple benefits they provide, including groundwater recharge, critical habitat, ecological connectivity, open space, aesthetic beauty, and recreation. Current 2030 population growth projections for California indicate that an overwhelming majority of housing development will occur on alluvial fans, posing significant risks to people, property, and the environment. Most long-range financial consequences will fall on local governments, which are often hit with the double impact of disaster recovery costs coupled with declines in tax revenue that follow major disasters. To address these multiple issues, the California State Assembly established the Alluvial Fan Task Force to review alluvial fan flood history, develop a model ordinance (MO) that would reduce long-term flood damage, and create land-use guidelines for resilient community development on alluvial fans. The task force determined that a more balanced and integrated approach to flood management and land-use planning is needed—one that conserves the beneficial values provided by alluvial fans while minimizing risk. 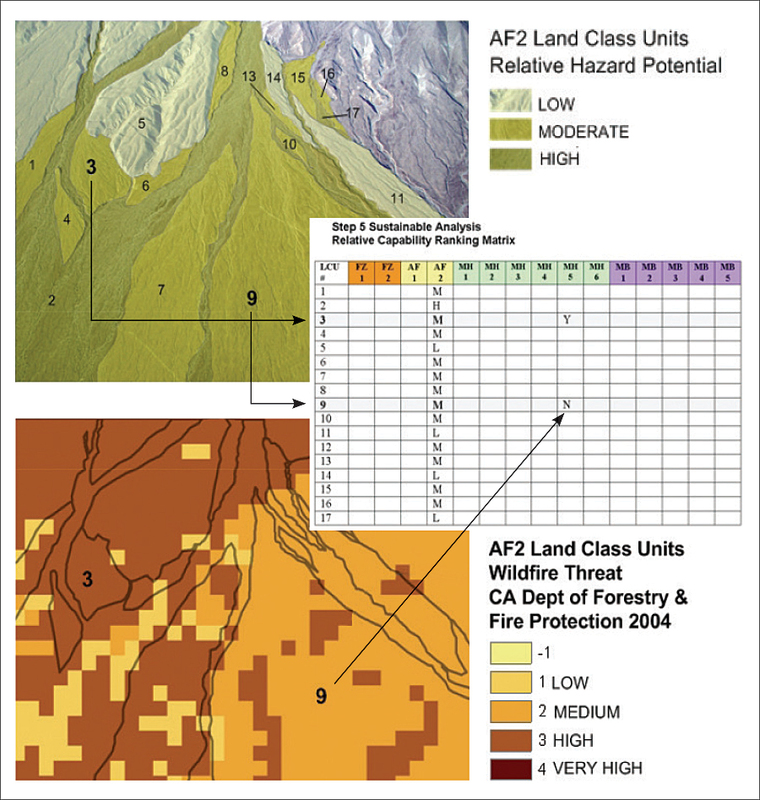 After considerable review of decision support methods, the task force recommended a GIS-based decision support tool as the best means of implementing a new MO and a more holistic and multidisciplinary approach to sustainable development on alluvial fans. It was determined that the toolset should allow developers and counties to prescreen proposed designs based on a complex set of scientific factors, building codes, and floodway design recommendations early in preliminary and conceptual design stages. In essence, anyone would be able to freely sketch vetted programmatic elements onto a web-based mapping interface to create design alternatives while receiving instant feedback on possible hazards and risk while maximizing the ecological and cultural benefits of alluvial fans. This set of geodesign tools could even be used to create the safety element of a general plan or a local hazard mitigation plan. 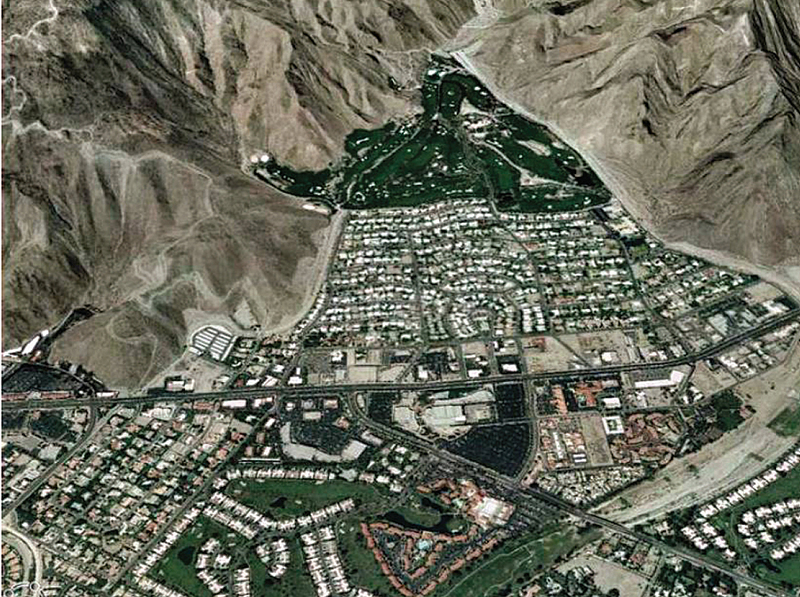 The tool would eventually be given the name the Alluvial Fan Land Planning Tool. Geodesign techniques, Esri ArcGIS for Desktop, and ArcGIS for Server have proved to be the perfect fit for the development of prescreening tools to help both developers and local government officials weigh the true costs and benefits of development proposals over the near and long term, building resilient community design right into the planning process. Step 1—Identify whether the proposed site is on a regulated floodplain with adequate hazard protection. Step 2—Consider relative flood hazard. Step 3—Consider other hazards present on the proposed site. Step 4—Consider beneficial resources present on the proposed site. Step 5—Consider capacity to address multiple objectives consistent with FloodSAFE. Examine the capability of a site for a proposed use. Examine the suitability of a site for a proposed use. Step 6—Consider problem-solving economic strategies. Take a holistic and integrated approach to assessing risks and encouraging avoidance. Put financing and insurance programs in place that handle the risks. Formulate economic strategies for sustainable development on alluvial fans that acknowledge private property rights and local cost-effectiveness. These six steps basically show what's happening behind the scenes—essentially, a framework and set of models that describe how the natural world operates and the influence it might have on the built environment, and vice versa. 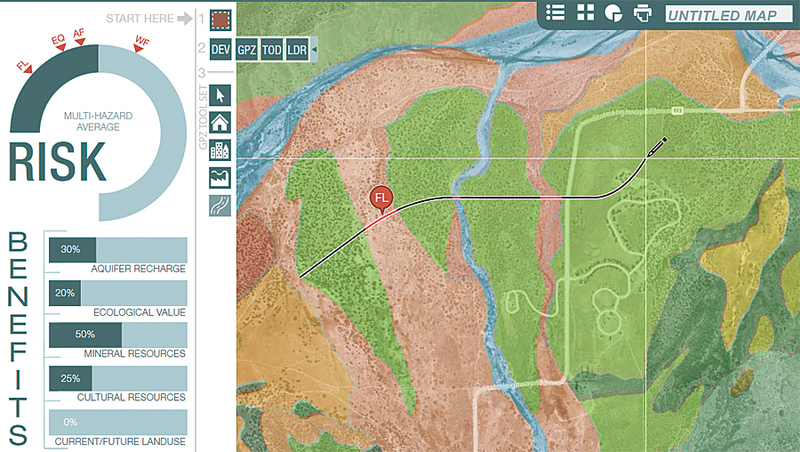 The Alluvial Fan Land Planning Tool is a web map portal that serves various map layers in a navigable, searchable map interface. The application supports a number of Internet browsers, requires no installation of special software, and runs on any mobile or desktop device that supports these browsers. The website is secure and requires the user to log in to activate the compare and save functions. The map canvas currently covers the Southern California region and gives the user several navigation methods to choose from including pan, zoom, typing addresses, or automatically centering on a GPS location, if available. The mapping tool has an easy-to-use interface and allows users to select a location, review the location's profile, and then compare it to other locations. Once a location has been selected, the user is presented with a location profile or summary report that includes detailed information about the site's multiple hazards and/or multiple benefits. Alternatively, the user can save and compare a number of profiles from different areas using the map comparison view. Next, users select the program elements or development types they would like to consider for that site. Once the user has specified a development type, a drawing palette is presented specific to that type, which opens a pop-up window that allows the user to adjust and save the user-defined values. 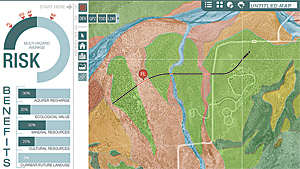 The user then selects the design element and begins to draw roads on the map canvas. The same thing can then be done with houses, and so on, until the design is complete. As the user is drawing on the map canvas, the application periodically analyzes the potential hazards and benefits associated with design elements that have been drawn. The results of the analysis are returned to the application and displayed through dials like those found on the dashboard of a car (see the figure above). 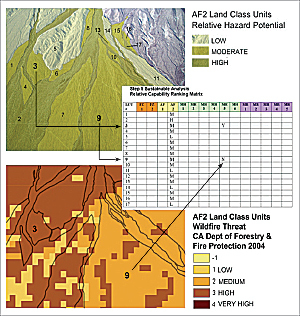 The benefits of the Alluvial Fan Land Planning Tool are many. It assists developers and regulators in consistently applying a suite of local planning tools for development on alluvial fans. The prescreening of plans helps highlight key issues for discussion and ensure completeness prior to formal submission of an Environmental Impact Report as required under the California Environmental Quality Act. These can both help save time and money through increased efficiency during the planning stage, reduce the number of unforeseen design changes, and decrease the risk of large disaster recovery expenditures in the future. The web-based geodesign prototype demonstrates that a simple spatial decision support tool could give a large number of users with little or no GIS training the ability to select site-specific program elements or land-use options, perform analyses of alternative scenarios, and balance performance versus cost to meet their particular needs. For more information on how to put geodesign into practice, contact Mr. Shannon McElvaney, Esri or visit esri.com/geodesign. This article has been adapted from chapter 9 of Geodesign: Case Studies in Regional and Urban Planning by Shannon McElvaney; ISBN: 9781589483163, Esri Press 2012.